As crew mate Ryan said, this makes a much better story than "We came in 6th". At 5am yesterday there was a sudden and brief becalming that was accompanied by torrential rain and then a dramatic wind shift happened accompanied by a huge spike in wind speed. Fortunately for me, this did not happen on my watch. I found myself bracing against the aisle-side frame of the bunk as the boat "crash gybed" so as not to tumble out when the tilt of the boat heeled the opposite way for which my bunk angle was set. A crash gybe is when the boat unexpectedly turns its stern through an arch passing the direction from which the wind is coming and then the wind flows across the opposite side of the boat. But the sails don't travel across to the other side of the boat like they are supposed to, because that takes time to set up and many hands to implement, especially with a spinnaker. At this point, the spinnaker (Code 3 - our smallest and heaviest weight) got wrapped and wrapped and wrapped some more around the forestays (up which we hoist the "white" sails (Yankee and Staysail) for sailing upwind. By the time skipper Matt arrived on deck from a deep slumber, the situation was beyond saving. It was all hands on deck to try and manage the situation. Portions of the sail were billowing and pulling the boat this way and that while other parts were tethered by being twisted around. Several attempts were made by brave crew (our strong and mighty Worlder men) to be hoisted up to either facilitate dropping the sail or just tether it to a forestay. The best that could be accomplished in the rocking sea state and strong winds (about 25 knots plus gusts) was to tether it at several additional points with sail ties to get it more under control and enable safe sailing with mainsail only to calmer waters. There was one major billowing piece in play. This took hours. Meanwhile it was mother watch for me. Meal plans and timing were out the window. There was constant call for nutritious and energy filled snacks, but little time for consumption. For much of the day, cereal, granola bars and lots and lots of water bottle refills was about all I could get into people. And lots of instant coffee. Icing bruised and banged limbs was also on the task list. I also managed to keep the hourly boat log updated as everyone else was on deck. Eventually the bacon and cheese frittata was consumed as each person was able to grab a short break. Plan #946 was to go off the race course and head around the top of the Philippines and seek shelter on the lee side. People following on Race Viewer must have been puzzled about what was going on. In calmer waters, several more hours were spent attempting to get the sail down. We ended up with all halyards wrapped in the sail with no further ability to hoist crew up the mast or forestay. Daylight was waning. 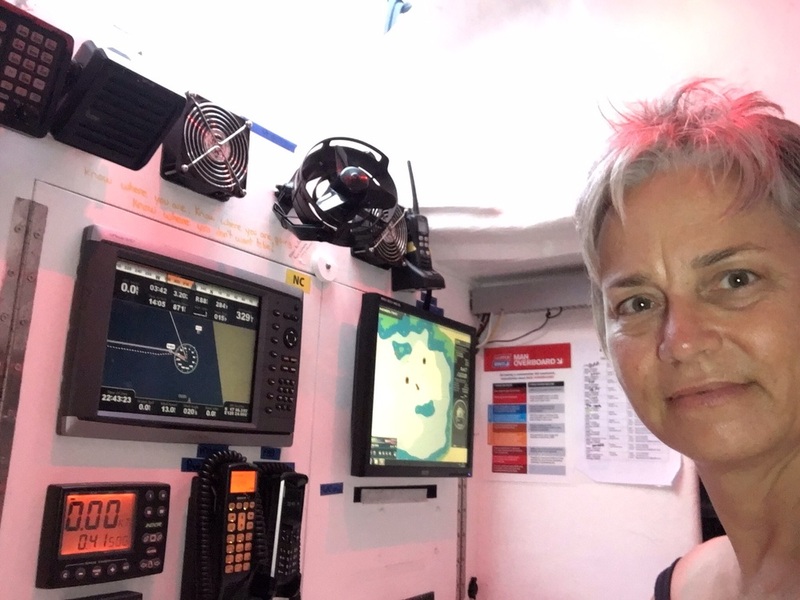 With help and direction from crew mate Caz, standing in for Justin who was needed on deck, a much appreciated chicken and veggie-mite risotto was prepared and hungrily consumed, again, gradually through the evening as people were able to grab a quick break. Plus fruit salad and hand-whipped chocolate mousse! Plan #1278 was to find better shelter in a harbour, anchor and resume sail rescue efforts. I had been reading about piloting and navigation in the region, so Matt turned to me to dig up info about nearby anchorages. 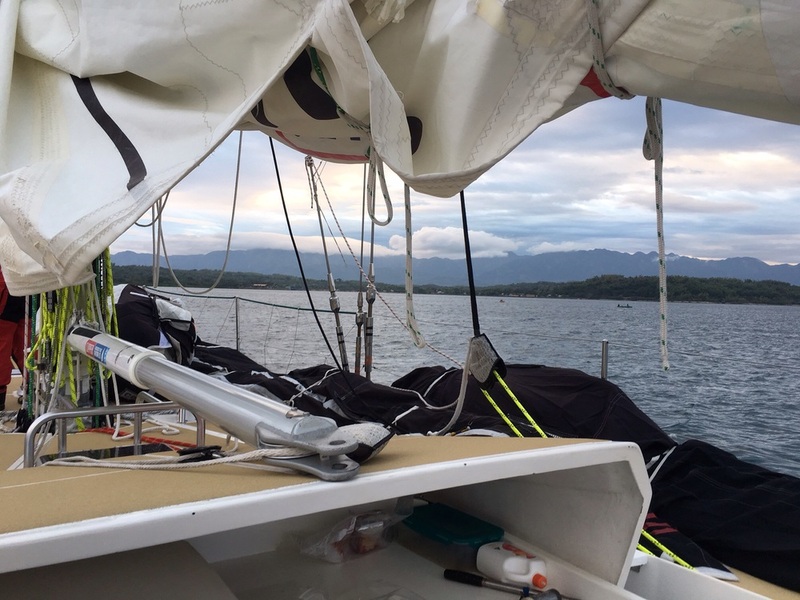 We settled on Salomogue Harbour, Philippines, about 2 hours sailing south. I put together a pilotage plan, especially important since we would be arriving In the dark of night in unfamiliar and not well charted waters. I was stationed in the navigation station, responding to Matt's queries about distance and bearings to various points on the nautical chart. Keeping at least 2 miles off shore, when the red flashing harbour light was on our port bow at 90 degrees, we then turned on the engine, lowered the mainsail, engaged the engine (at which point I marked the spot as a weigh point in the navigation software and made note of time and location in the log), then turned due east to head for and pass between two buoys set at the entrance of the small harbour to keep us off the reefs. Crew were stationed on deck as lookout and the search light was plugged in and brought on deck. In 14 meters of calm water, we dropped anchor at close to midnight. No simple task. It took almost all hands on deck to wrestle it out from under the floor boards in the sail locker and pass it hand over hand over the side. No electric anchoring winch on this race boat! So far, apart from very brief catnaps for a lucky few, there had been no sleep for the already tired crew since 5am. But we pressed on with our work. More coffee, "biscuits" and candy was served up. With the main sail down, we once again had a halyard available for hoisting people up the mast. Matt climbed the mast to unfasten the forestay so that the crew could carefully lower it to the deck. As "mother" and with a minor knee injury to attend to, I was sent below for a few hours of blissful sleep. Unfortunately, Matt couldn't unfasten the inner forestay. Other crew were sent up, and ultimately the head was cut away from the sail (and, sadly, lost overboard). About 7 hours after laying anchor, the job was done. I was roused just after sunrise, and stationed once again in the Nav station. It felt symbolic that, 28 hours after the mishap, I was able to turn to a new fresh page in the log book at 00:15 hours UTC (Universal Time, um, Clock? ), 09:15 local time, and enter "returned to 'resume race' weigh point, raising sails".